Best Dayak Rock Artiste ‘Masterpiece’ receiving their award. 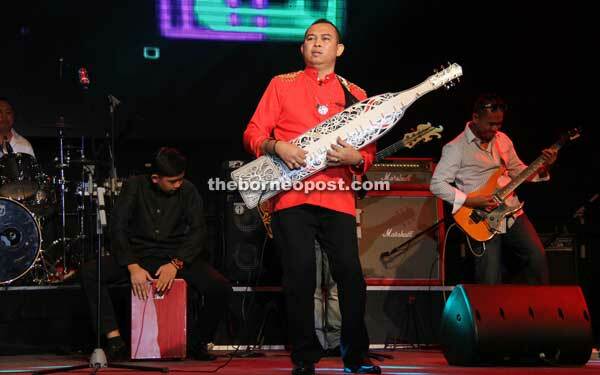 KUCHING: The Dayak Music Awards (AMD) 2014 organised by Dayak Artistes and Musicians Association (Dama) on Saturday night saw Iban singer Gabriel Fairuz Louis stealing the show by winning most of the categories. 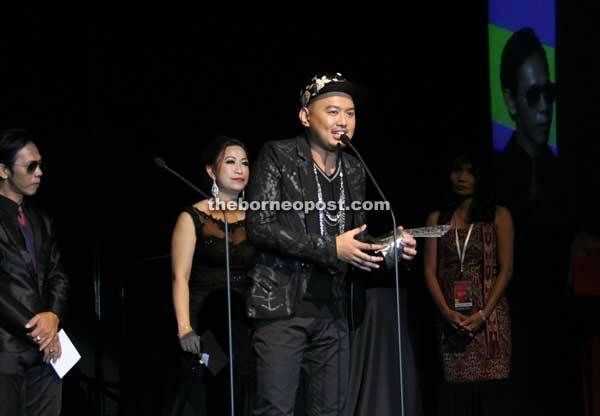 He won in all the five categories nominated; namely Best Dayak Album, Best Iban Song, Best Dayak Pop Artiste, Best Dayak Ballad Artiste and Best Dayak Male Artiste. AMD 2014 was held at the Borneo Convention Centre (BCCK). Met after the awards presentation, he said he owed his memorable success to his team of writers, composers, musicians and all who worked with him to produce his materials as without them he certainly would not have made it. “I would like to see this as a team effort rather than an individual one. “Every good artiste in my opinion must have a good team that helps him with his work and in this team, my team’s hard work paid off,” he added. Other winners were The Crew (who won two awards namely Best New Dayak Artiste and Best Dayak Group or Duo), Ronney Bukong (Best Album Cover), Calhiem Sawin (Best Dayak Music Video), Monica Elen (Best Dayak Female Artiste) Janang Ensiring/Embat Lala (Best Iban Lyrics), Masterpiece (Best Dayak Rock Artiste), Norman Ading (Best Dayak Music Arrangement) and Rannee Pat (Best Bidayuh Song). 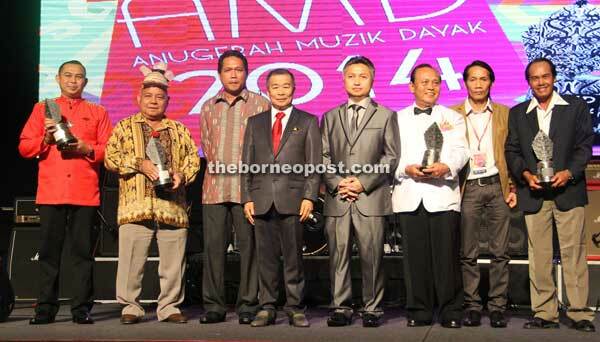 Apart from the 16 award nominations, three lifetime achievement awards for Dayak musicians who contributed considerably to the development of Dayak music and one Dama special award were also handed out that night. Iban singing legend Christopher Kelly, Kayan sape player Henry Anyi Ajang and Bidayuh veteran crooner Mike Rantai were each given lifetime achievement awards while the Dama special award went to renowned Iban sape player Jerry Kamit for his works and significant contribution to Dayak music development. “While winning this award is sweet as it recognised my contribution to the Dayak music industry and its development, all I ever wanted is to see Dayak music remain loved and relevant forever. “I dedicated my life to Dayak music and I hope there won’t be any shortage of people doing the same out there, be it in the present or the future,” said Christopher. Meanwhile after winning the inaugural Best Dayak Single award, Seventh Tribe GMP band hoped that the award would not only spur more talented newcomers in the Dayak music industry to produce good music but dare to be different as well. The band’s drummer Sam Maoh was grateful that their hard work had paid off and the musical formula they had put in worked wonders. A few local Dayak artistes such as Masterpiece, Jerry Kamit, Mezzavoce, The Crew, Alon Lopeng and Seventh Tribe also performed during the night. Assistant Minister in the Chief Minister’s Office (Bumiputera Entrepreneur Development) Datuk Mohd Naroden Majais graced the ceremony while Dama chairman and Balai Ringin assemblyman Snowdan Lawan, Sadong Jaya assemblyman Aidel Lariwoo and AMD 2014 managing chairman Brown Sang Lagan were among the distinguished guests. “This award is one of the best ways for Dayak musicians to get full support and recognition. “Although the industry is developing well, the (state) government is also constantly looking for ways to help them get a wider audience and market,” commented Naroden during a press conference that night. AMD was first held in 2008 and has been held bi-annually ever since. It serves as a platform to recognise the works and efforts of Sarawakian Dayak musicians and industry players. Gabriel giving a special message after receiving one of his five awards. 2014 Dama special award winner Jerry Kamit performing live during the event.